OD has an established tradition. There is a community of practice, academic research, handbooks in all sorts, development of new practices, lots of publications, proven methods. All seems fine. At the same time there is recurrent talk and publications expressing worry about the future of OD. It discusses how OD thinking is neglected in boardroom decisions, in mergers and acquisitions, in large-scale strategic change. It expresses doubt about the impact of OD on the big issues of today. Some in OD express disappointment at the lack of recognition in the outside world for what the OD community could bring to the table. All this presents a puzzling contrast between the strengths of OD know how and tradition versus this lack of position in the arena of organizational change. The contrast presents different possible meanings. Should OD practitioners e.g. do their work better? Should know how be more aggressively presented? The paper explores what might explain the contrast. It suggests that the lack of position might have little to do with the quality of OD know how and practice, but much to do with the recessive nature of the kind of change strategies employed. Though this contributes to their potential added value, it requires political competence to create conditions where it can actually do so. 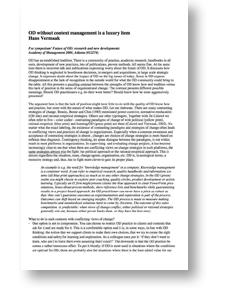 Context management is an additional competence that distinguishes those practitioners who are able to use OD to its full potential in environments that are not at all geared to it from those who are condemned to superficial work or selling out.